Of the five persons who were killed, two were minors, the police said. Rajauli Police Station Officer-in-charge Awadhesh Kumarsaid the driver had lost control over the vehicle. Five people died while and 50 others were injured when a bus, carrying mostly brick kiln labourers, tumbled into a ditch in Nawada district in the early hours of Monday. 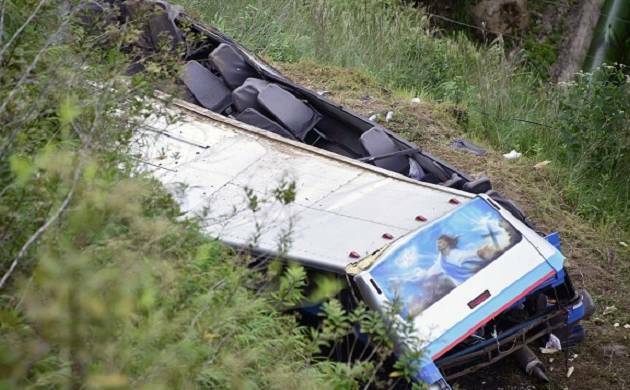 12 passengers were in a serious condition. Of the five persons who were killed, two were minors, the police said. Rajauli Police Station Officer-in-charge Awadhesh Kumar said the driver had lost control over the vehicle. He may have dozed off at the wheel, he added. The accident occurred at nearly 2 am on NH 31 nearAndharbari village when the bus was on its way to Biharsharif, the district headquarter town of Nalanda, from Kolkata, thepolice officer said. All the victims were residents of Budhaul Beldariya village under Town Police Station of Nawada district. The identity of the deceased, however, has not been ascertained so far, he said. The twelve passengers, who sustained serious injuries, have been referred to Patna Medical College and Hospital. The rest of the injured have been admitted to Rajauli sub-divisional hospital and Nawada Sadar hospital, he said.